Electronics don’t last forever. But, just because your TV or VCR has stopped working doesn’t mean it’s doomed for the trash! 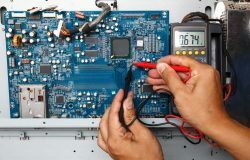 Bring your defunct or malfunctioning electronics to BAS Electronics TV & Electronics Video Repair to have them repaired and restored to their former glory. We’ve been putting our expertise in tech repair to work for more than 30 years, helping our clients with TV VCR, DVD and stereo repair in St. Charles, MO. Whether it’s problems with audio and video, power issues or a component replacement, we’ll see to it your electronics get what they need to work reliably. Not only are we equipped to work on a diverse range of electronics, we can get them back to working regardless of the brand name. Look to us when you want to save money by repairing your electronics, instead of junking and replacing them. We aim to offer affordable repairs, so you’re able to get the most out of your electronics. Our repairs are priced according to a flat rate and the cost of parts. Whether you need stereo rewiring or TV repair in St. Charles, MO, we’ll make sure the cost is affordable. See below for base-rate pricing. Please note that for computers, the scope of repairs can vary. Pricing starts at $75 plus parts, but can increase depending on the repair. We will provide you with an estimate of this cost upfront. If we are not able to repair your broken equipment but want it returned to you un-repaired, we charge a $25 to $50 estimate to hold it for its eventual return to you. In the case of us not being able to repair your equipment and you do not want it returned back to you, we will not charge you a an estimate fee. Think twice before you throw that old DVD player in the trash or drop thousands on a new TV! Contact BAS Electronics TV & Electronics Video Repair today to get the repairs necessary to keep your electronics working right. Reach us at 636-926-2911.